When you have an issue where CentOS will no longer boot, you have to be able to get into the operating system to resolve the problem. I have had to boot into single user mode to resolve issues with file system mounting, or edit network settings when there is a problem with eth0 settings. All of these situations are easy enough to resolve if you can just get into the operating system to fix the problems. In these cases, booting into single user mode has allowed me the chance to resolve the problem. Power up the machine and when you see this screen, hit the space bar or any other key before the timeout. Next up, we will be given the list of kernels that we can boot from. Choose the one that you typically boot to. Typically, it is the latest one. We use our up and down arrows to get to the proper kernel and then hit the “e” key to signify that we wish to edit it. 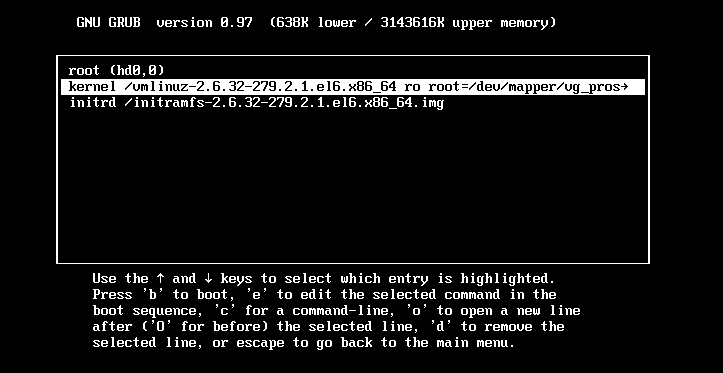 Now, we are editing the kernel’s boot options. Choose the line that begins with “kernel” as shown in the image to the right. Then hit the “e” key again. Type the word “single” at the end of the options. Then hit the “Enter” key. It will now boot your CentOS operating system into single user mode and you can resolve whatever issues you have that caused you to need to boot CentOS into single user mode in the first place.